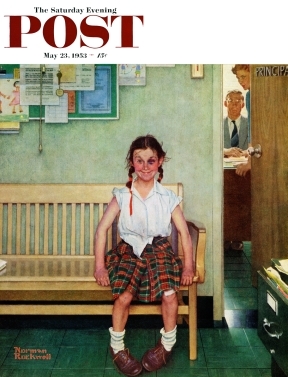 "For once the little girl is victorious," says Mary Whalen Leonard of her portrait outside a principal's office. Sometimes in life you have to take a beating — literally or figuratively — to stand up for the truth, yourself, a loved one, or something you truly believe in. 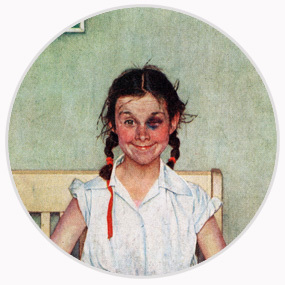 And it’s always worth the cost of that battle, as this girl’s triumphant smile, even with that shiner, celebrates. “My recollection of working out this picture with Norman [above] is one of laughter and fun. He showed me the sketch and wondered what I thought about it. I got it. It was about role reversal. For once the little girl was victorious, and it did not matter that she had a black eye. That was the mark of the trophy!